DescriptionMetal powders are highly engineered materials used to manufacture precision metal parts with a wide range of performance characteristics. The choice of production method is determined by cost analysis, raw material supply, and the particle size and shape distributions most beneficial to performance. The metal powder can then be used to fabricate parts from simple single level shapes to complex multi level shapes. The technique and study of these processes is known as powder metallurgy, a field of study well acquainted with particle characterization. DescriptionThe high speed and air dispersion of the CAMSIZER X2 can be used to identify trace amounts of large particle impurities with mass concentrations as low as 0.005%. This technique allows very tight specifications of raw material and corresponding improvement in manufacturing quality and part reliability. DescriptionActivated carbon is a type of carbonaceous material that is made extremely porous through processing. The very large surface area of activated carbon makes the material useful for chemical adsorption or reaction. 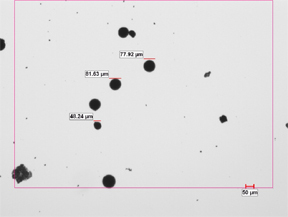 Particle characterization of activated carbon often includes size, shape, and surface area measurements. Dynamic image analysis has proven useful for the size and shape analysis of many forms and grades of activated carbon and has successfully replaced older techniques such as sieving at factory plants around the world.